I studied a lot of drama in college, and later used what I had learned in several community theater productions. I’m lucky to live in a good ‘theatre’ town, with several non-profit companies that cover everything from Euripides to musicals to original works. Although the acting bug stopped biting me awhile ago, I loved nearly every moment of rehearsal and performance, not least because I had the chance to appear in some wonderful productions. Plays differ from movies in a lot of ways, but one of the biggest contrasts is, as one of my favorite directors used to say, “Movies move, plays talk.” Film, based on photography, depends on images to tell a story. Theater, defined by the presence of actors and audience in the same space at the same time, depends on dialogue. While I write books, not plays, and have an array of writing devices to use in story-telling, I still love good verbal interplay between characters. Whether as a writer or a reader, I demand a lot of a character’s speech (and since narrative can go inside someone’s head, their thoughts). A character’s vocabulary and grammar can inform the reader of his or her background, social or educational level, and relationship with other people in the room in the space of a few words. Our speech is influenced by our gender, our mood at the moment, and our basic natures. So is a believable fictional character’s. One of my favorite series is the Charlotte and Thomas Pitt mysteries by Anne Perry. Thomas, although the son of a gamekeeper, speaks like a member of the upper class. This works because Perry explains that as a boy, he was permitted to share lessons with the son of his father’s employer. That’s only one example. A cowboy from Texas won’t have the same accent or slang as a Boston-raised lawyer, even if they both went to Harvard. One of the biggest aspects of a character’s speech and thought is gender. Men aren’t as verbal as woman, and unless it’s in an area they are trained to observe, they often don’t notice details. A hero who identifies the designer and exact color of the heroine’s dress is not going to come off as realistic. Yes, some heterosexual men can identify colors like puce or burnt sienna, if they’re artists like my stepmother’s brother. But most men will say “purple” or “brown”, like my hubby. Do you have any favorite conversations between characters in your books? I’d love to hear about them. And as an extra bonus, I’ll send out a wee little prize related to Her Scottish Groom to the first person who identifies the actors pictured at the top if this post, along with their best-known science fiction roles. 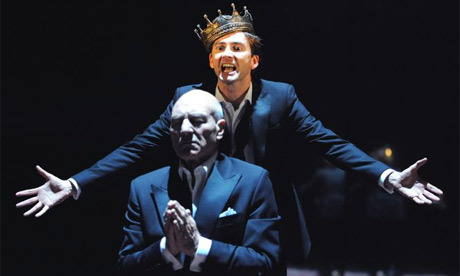 Hint: the photo is from a British production of Hamlet. “…I need this as much as you do,” Elizabeth pleaded. She still felt the heat from their last kiss spread throughout her body. “You do not say? As you should know, Elizabeth, no woman after seeing my face would need to be with me in that way.” Fastening the last latch on his breeches, Lord Kendall moved about the room to the other side of the bed. There, just an excerpt from the book I wrote, called ‘The Phantom of Fonthill Abbey’. David Tennant – played in Doctor Who as The Tenth Doctor. Sir Patrick Stewart- played in Star Trek as Captain Picard. Well done, Diva J.! Send me your snail mail address via the ‘Contact me’ form & I’ll get your prize out to you. I’m glad you enjoyed this post, and thank you for sharing your excerpt.